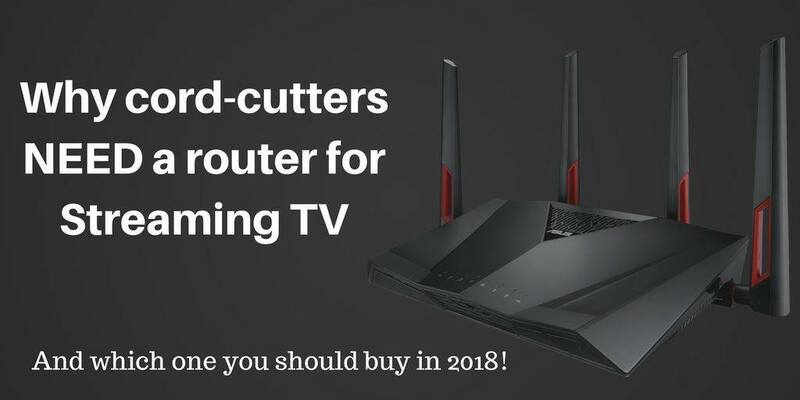 Home » Streaming Devices » Best router for streaming TV 2019: Why cord-cutters need a router for streaming TV – with recommendations! Best router for streaming TV 2019: Why cord-cutters need a router for streaming TV – with recommendations! A router for streaming TV? Won’t any router do that? 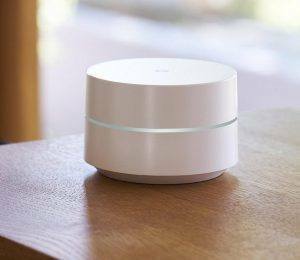 Your router stands at the center of the digital world in your home. Think about how many devices are connected to your router right now. Smartphones. Tablets. PC. Laptop. Streaming devices. Game consoles. Blu-Ray player. Television. Google Home or Alexa. Network Accessible Storage (NAS) Nest thermostat. Smart lights, fans, sprinklers, home security cameras. Oh wait..that’s everything that’s connected to my router right now. You might not have that many different devices, but I’ll bet that it’s way more than you think. And you’re probably still using that tired old budget router from six or seven years ago. So you’ve got a lot of devices and we all know that streaming uses a lot of data, but why do you need a new router for streaming TV? If you’ve got an older router, it may be struggling to keep up with the data demands of all those different devices. Even worse, old routers did a terrible job of prioritizing data. To them, a smartphone surfing the Internet got the same priority as a game console or 4K television. Imagine an intersection with a four-way stop sign. Whoever gets there first gets to go first. Modern routers are much faster than their older siblings, definitely. Where they really shine is that they’re smarter in creating a fast-lane for your highest priority traffic. So let’s get some basic stuff out of the way first. Which is better 2.4 GHz or 5 GHz? Routers have different frequencies that they operate on, the most common being either 2.4 GHz or 5 GHz. Like most things, it depends on what you’re using it for. In general, 2.4 GHz has a longer range than 5 GHz, but is more congested and has a slower overall speed – in ideal conditions. That phrase “ideal conditions” is a HUGE caveat, and we’ll get into that later, but for now, let’s get more specific on each of those differences. If you remember from high school science class, frequencies are waves. The higher the frequency, the closer together those waves are. 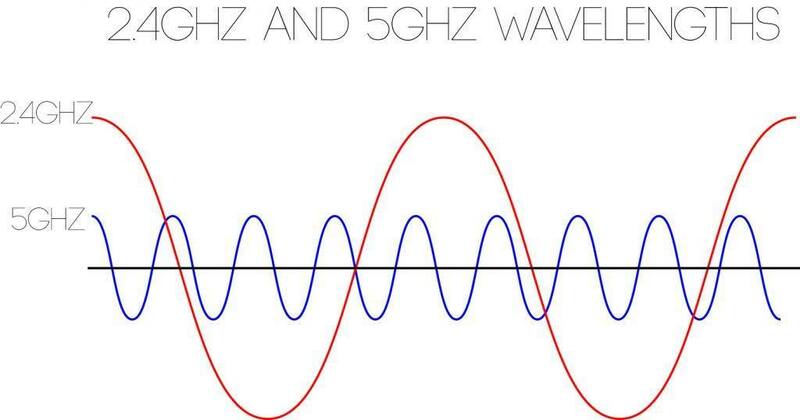 So, a router using 2.4 GHz has taller and more spread out waves than one using 5 GHz. According to invisiblenetworks.co, shorter waves have a much longer range because less energy is dissipated when it hits surrounding molecules (including things like walls and even air). What this means for you is that longer range applications should be using a 2.4 GHz bandwidth. The same is true when you need to send the signal through walls or other obstacles. On the flip side, the shorter the wavelength, the more data can be compressed in that wave. 2.4 GHz can support speeds of up to between 450 Mbps and 600 Mbps, depending on the class of router, while 5 GHz can support speeds of up to 1700 Mbps and beyond. In general, any time when you want to get the most bandwidth possible, you should be using 5 GHz bands at short range. One additional factor to consider is congestion – not only on the network, but other devices around your home. For example, did you know that your microwave could be slowing down your 2.4 GHz router? The same goes for your garage door opener, your baby monitor and many cordless phones – if you even still have one of them. All those devices contribute to interference in your home. The more interference you have, the harder it is for the signal to punch through congestion to get where it needs to go. Now that we understand frequencies a bit better, let’s talk about multi-band routers. The term frequency and band can be used interchangeably. So what we’re really talking about are routers that can operate on multiple frequencies at the same time. Think about it this way: If you’re watching TV and browsing the Internet on your phone at the same time, your phone doesn’t need as much bandwidth as your TV does. It just has to display a static page until you move to the next one, but your TV is streaming 4K content. That uses a whole lot more bandwidth. What a multi-band router allows to to do is shift the traffic that needs that speed to the 5 GHz band (your 4K TV) while keeping the devices that aren’t as demanding (your smartphone) on the 2.4 GHz band. Think of this as setting up an express lane for your higher speed traffic. 802.11a, b, g, n, ac…huh? OK…here’s where it gets confusing, so feel free to skip this part if you want. Whenever you see the 802.something on the spec sheet of a networking product, what you’re really seeing is where that device fits on the IEEE (Institute of Electrical and Electronics Engineers) 802 standard. Specifically, the 802.11 standard covers wireless local area networks. All of those letters after it designate specific subsets of that standard. One important thing to remember is that if your network is only as fast as its weakest link. For example, if you’re using an 802.11ac router but connecting an 802.11b device to it, that device will only go at a maximum of 11 Mbps. You may need to upgrade the adapters on your devices in order to get the full effect of your new router. If you want a small, unassuming router that blends in with the rest of your electronics, the ASUS RT-AC88U (check prices on Amazon) really isn’t the router for you. Seriously, this thing looks like a cross between a Lamborghini and a spaceship. Make that a HUGE spaceship. This think is massive – sitting at just under 12 inches across by 8 inches deep. It needs that extra real-estate to fit eight (count ’em 8!) gigabit Ethernet ports. Two of them have link aggregation capability. In English that means you can plug a single device (like a NAS) with two network adapters into those ports and double your network throughput all the way up to 2 Gbps. If you instead want to hook up a smaller external drive to the router directly, you can do that too using the rear USB 3.0 port, or the front mounted USB 2.0 port. But getting back to speed, it boasts a theoretical maximum wireless speed of 2167 Mbps on the 5 Ghz band and up to 1000 Mbps on the 2.4 Ghz band. It has multi-user MIMO which allows multiple devices to send and receive data at the same time…hence the “multi-user MIMO” part. What I really love about ASUS routers is their intuitive setup process and management portal that will let you be as simple or as in-depth as you want to be. Plug and Play setup? Check. Dozens of options to configure? Check. Add a VPN to your router? Check. The ASUS RT-AC88U isn’t cheap, coming in at around $250 (Find it on Amazon). If you’re using your router for streaming TV and not for gaming, you’d be hard pressed to find a better router. For about the same price as the ASUS, you could instead opt for the Google Wi-Fi mesh router system (check prices on Amazon). So if the ASUS is that good, why would you go with the Google? Two main reasons: Coverage and Simplicity. I decided to go with a mesh network in my home because I wanted consistent coverage whether I was sitting on my front porch or working in my garage. Even though I don’t have a large house by any means, a single router would have had holes in the coverage no matter where I put it. It’s also extremely simple to set up and use. Everything is done through Google’s app with a simplicity that even my mother could understand. Sure, it doesn’t give you anywhere near as many options as the ASUS, but it’s got the important stuff: guest networks, parental controls and the ability to track usage by device. 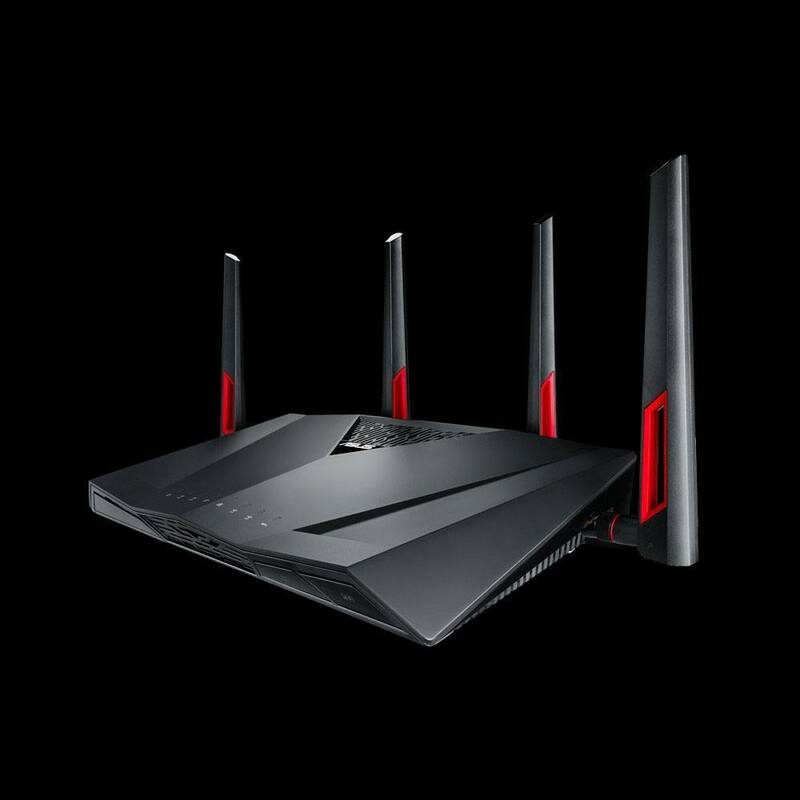 The Google Wi-Fi isn’t as fast as the ASUS, so if you’re going to be doing 4K streaming, this isn’t the right router for you. I’d instead opt for the ASUS and maybe an additional wireless access point, depending on the size of your house. But if consistent coverage is a bigger priority and a limited number of people are going to be streaming at any one time, I’d seriously look at the Google Wi-Fi mesh routers (Find it on Amazon). There are a lot of routers on the market and it can get really confusing to try to pick the best one. If you’re like me, you probably keep your routers for several years and really don’t think about them until they stop connecting when you want them to. If you spend a lot of time watching TV, shouldn’t you have a router for streaming TV…or at least one that lets you stream wherever want to be in your house? Hopefully this has given you a little more info on how a router works and what features to look for. If you have a router that you think should have been on this list, let me know in the comments below! The VPN only affects the device you install it on. So installing it on your desktop will not affect your other devices. You can purchase a router that supports VPNs. Look for DD-WRT or Tomato based routers, or go with ExpressVPN”s router if you want something easy but a bit pricier. The other option is to create a VPN enabled virtual router using your laptop/desktop. Search for “virtual router on our site for a tutorial on that.